The below artworks are the most important by Paul Signac - that both overview the major creative periods, and highlight the greatest achievements by the artist. Artwork description & Analysis: Signac's first major interior scene, The Milliners takes up a subject often represented by the Impressionists, including Degas and Cassatt. Further, his companion and later wife, Berthe Roblès was herself a milliner or hatmaker. Berthe posed for this work: she is the woman on the left, who bends to retrieve her scissors. The work is set in the workshop of a milliner in the Sentier quarter in the center of Paris; the area is still the city's garment district. Originally, the title referred to specific roles of the figures in the work, as the "trimmer" and the "finisher." This is a testament to Signac's ongoing insistence on accuracy. He had acquired from Berthe a wealth of information about millinery and its particular terminology in the interest of producing a work that transcended mere general, visual documentation. Not unlike Impressionist painters like Degas in particular, who frequently represented working class women, Signac observed them and, in a sense elevated their status via his paintings. This painting is clearly one from the early years of Neo-Impressionism and, in fact, was begun and then reworked in the developing Pointillist style. An ardent admirer of Delacroix, especially his use of expressive color, here Signac uses a virtually identical palette to that of Delacroix's Women of Algiers (1834). In both Delacroix's and Signac's paintings, a feminine world generally excluding of men is represented although Delacroix's women are enclosed in a harem, thus magnifying the sense of exclusion of the male viewer. In this early work, the primarily self-taught Signac is still struggling with the articulation of fictive space. The workshop in which the milliners are confined is quite shallow, further emphasizing the sense of intimacy and companionship. Further, at this early stage in the development of Neo-Impressionism, the surface does not shimmer like it does in his work even a year later. According to accounts from Seurat as related to their mutual friend, the important art critic Félix Fénéon who actually coined the term "Neo-Impressionism" (and not in a pejorative way), Signac had been "won over," having modified the painting using the new technique at the same time that Seurat was finishing (reworking) La Grande Jatte. Artwork description & Analysis: When Signac produced this work, the powerful influence of Impressionism still exerted considerable force in terms of his style. This painting, produced in Les Andelys in Upper Normandy on the banks of the Seine River, features the short brushstrokes and naturalistic palette of Impressionist works. Light, as it flickers in the air and the water, is given the attention customary to an Impressionist painting, particularly as seen in works by Monet and Pissarro, both of whom were mentors (almost indirect teachers) of the self-taught Signac. During the summer of 1886, Signac lived in the small town of Les Andelys during an incredibly formative time in which he produced ten landscapes utilizing the Neo-Impressionist technique that he was refining in collaboration with Georges Seurat. He exhibited this work, a placid scene of small town life on the river that also flowed through the lively capital city of Paris, at the Salon des Artistes Indépendants in 1887 along with three other paintings from the series. 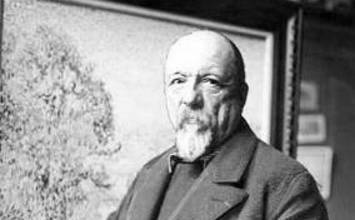 Important critics, including Gustave Kahn, Paul Alexis, and Félix Fénéon (who was to become his close friend), were impressed by Signac's work. Fénéon wrote: "Mr. Signac's verve accentuates the bright contrasts in his new canvases" Likewise, Kahn commented on the artist's expert depiction of light: "It is the glare of the midday sun which is caught in these landscapes; of all those that we know they are the most deeply infused with the joy of things and illustrated with the magical effects of light." Artwork description & Analysis: This drawing is one of many finished works in media besides oil on canvas that Signac produced throughout his very long career. The theme, a genre scene, a common choice for the Impressionists and generations of artists before them was one favored by Signac. Indeed, a painting of the same title he showed at the Salon des Indépendants in 1887 is quite similar to this one compositionally. This drawing, graphite and ink on paper, was created as an illustration for La Vie Moderne, the Parisian review of arts, literature, and other culture, in April 1887. Here, Signac's meticulousness is apparent. Without the distraction of and interplay between colors, the way in which he structures forms is more obvious. Even in black and white, his ability to create an overall shimmering effect is evident. He began this drawing by putting down a light layer of graphite over which he added layers of dots carefully arranged to create variations in tone and to describe volumes. A genre scene nonetheless, members of Signac's family posed for the figures represented here, including his grandfather and his mother as well as the family's housekeeper. None of them interact with one another; rather, they all seem to be going about their individual routines but doing so in a sort of quiet harmony. Artwork description & Analysis: In 1890, Signac honored his friend, the influential art critic, dealer, collector, political activist, and curator, Félix Fénéon, with a portrait that remains one of the artist's most memorable and successful works in the Neo-Impressionist style. This unconventional portrait mirrors the subject's originality. The enigmatic Fénéon with his signature goatee, walking stick, and top hat, seems to set in motion a process of abstraction based on the ironically white flower he extends toward the whirlpool of brightly colored and patterned waves. In the picture, both the flower and Fénéon remain static amidst a symphony of color; indeed, music is suggested by the word "Opus" in the title. As for the title, the MoMA suggests that the very long title for this work may be "a spoof on scientific terminology." That said, both Fénéon and Signac, as well as Seurat and other Neo-Impressionists, were fascinated by the work of Charles Henry, whose recent publication on optical theory included a color wheel. Signac's portrait of Fénéon is that color wheel set in motion. Artwork description & Analysis: In Woman with a Parasol, Signac's companion stands serenely holding a bright-colored, orange umbrella and looking serenely to the right, beyond the picture plane. Her face reflects the light coming through the umbrella but the rest of her body and the composition as a whole are bathed in a subtle, purple-blue light. Robles, whom Signac had met at Le Chat Noir, a popular cabaret in the Montmartre quarter of Paris, was a distant cousin of Pissarro. Shortly after Signac produced this portrait, the two were married. While the portraits of Fénéon and Berthe are both featured here and are exemplary of the range of the artist's mastery of color - particularly the optical mixing of Neo-Impressionism - in fact, portraits by Signac in the Neo-Impressionist style are somewhat unusual. This work constitutes the final portrait in a series the artist had made depicting family members and close friends. The theme, of a woman sheltering beneath an umbrella, was also a common one for the Impressionist artists. Monet, whose work Signac had emulated early in his career, represented the subject repeatedly, for instance. Notably, the scene lacks depth; short of being flat, Signac's use of fields of seemingly solid colors (mixed, of course, optically as the dots are not of a uniform color) is reflective of his interest in Japanese prints, which had captivated other artists of the period. In Japanese prints, the articulation of space is similar to what Signac has done here. There is very little modeling to create the illusion of three-dimensionality. Instead, the emphasis is on color and the juxtaposition of simple, geometric forms that make up the figure and her umbrella. The addition of the floral pattern on the lower left seems a direct quote of Japanese decorative art. Artwork description & Analysis: By 1898 when Signac produced this painting at his studio in Saint-Tropez, his approach to Neo-Impressionism had transformed from the experimental years of early 1880s. Consistently an artist who produced sometimes multiple preparatory drawings, including in color, prior to beginning a painting, Signac made a number of sketches for Lady on a Terrace. Note that, in comparison to earlier works, the dots or points of his Neo-Impressionist style have grown larger although still careful, contained, and his palette is far less subdued. When looking at such works, it is evident from where Matisse drew inspiration for his early, so-called "pre-Fauve" works like Luxe, Calme et Volupté (1904). Indeed, both in terms of palette and brushwork - the staccato application of dot-like forms - the work by Matisse very closely resembles Signac's. Ever concerned with the combined effects of light and color, in this picture Signac designs the composition so that, says the National Gallery of Ireland, "receding bands of color on the terrace, balustrade, planting, wall and sea, lead the eye from the shallow foreground space towards the distant mountains." The form of the female figure - the model was his wife, Berthe - is an emphatic vertical to the horizontal bands of the terrace and so forth. The towers and trees echo her verticality; there is a sense of serenity and balance in this expertly painted recap of a beautiful sunset on the French Riviera. Artwork description & Analysis: In 1913, having already separated from his wife Berthe, Signac moved to a rented house in Antibes, where he lived with Jeanne Selmersheim-Desgrange and their daughter, Ginette, who was born in October of that same year. Berthe continued to live in the house in Saint-Tropez and she and Signac remained friends. Signac painted some of his most vibrant pictures yet in Antibes. Painting just as frequently in watercolor as in oil, works from his later years were limited in subject matter largely to harbor scenes like this one, and to riverbanks. While he traveled a great deal and painted where he went, boats and other features in a painting of the Grand Canal in Venice look very much like those in paintings of Antibes, Constantinople, or Marseilles. All are radiant with color and reflect his far less strict adherence to the disciplined, organized approach of Neo-Impression which was, as one art historian, John Leighton, put it, "an art renunciation and restraint." It seems that once Signac freed himself somewhat from what he eventually regarded as "the burden of description," he could produce optical effects of a different nature. Far less meticulously set down, the marks of pigment bright greens, blues, and pinks in the foreground and warm oranges, yellows, and reds beyond - create an effect of constant motion. Rather than merely shimmering as do his Neo-Impressionist works of earlier in his career, the later works have a kind of romantic, unrestrained liveliness more in tune with the paintings of the Fauves, the Symbolists, and the Nabis. Indeed, the painter Maurice Denis described Signac's later work, "with its combination of graded color and sentiment" as a kind of "reasoned romanticism," so distinct from "the scientific naturalism" of his work of the 1880s and 1890s. First published on 14 May 2017. Updated and modified regularly.